Bio is not ready for peace. His supporters have maligned SLPP party leadership aspirants and the chairman – Chief Somano Kapen (Photo). Few weeks ago, Julius Bio wrote an article to declare that he was willing to meet anyone who has a grievance against him to discuss peace in the party. But Knowing the way his supporters operate as I do, I immediately dismissed Bio’s call for peace as his usual hypocrisy and deception. 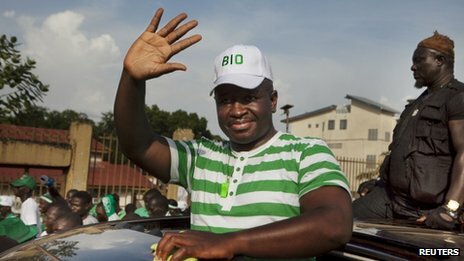 Reading the statement written by one of his disciples – Josephine Koroma, who has effectively become the spokesperson for Bio, it is apparent that Bio and his supporters are not ready for peace, and do not want peace for the SLPP. The article is deeply offensive to all of the major leadership contenders in the party, such as Andrew Keili, Kandeh Yumkella, John Benjamin and others who may follow. What is most reprehensible and divisive is that the article specifically, also, attacked Chief Kapen who is the chairman of the SLPP National Executive council (NEC). According to Josephine Koroma, no other SLPP leadership aspirant has criticised the APC government, implying that Bio is the only one doing so. One imputation the author crafted out of this nonsense is that, those who do not criticise the APC administration, are either a sell out or they are APC supporters. Well, these are the messages Bio supporters with his knowledge are sending out to the party, whilst at the same time Bio is indicating that he is ready for peace dialogue. This is a stupid and a pathetic strategy. It confirms my conviction that Bio and his supporters are no good for SLPP unity and progress. Politics and responsible leadership is not just about shouting from the roof about issues, such as poverty and government mismanagement, which is the duty of every Sierra Leonean. I have consistently done it, journalists are doing it, civil society members are doing it, and market women are doing it, because it is an issue that concerns all our citizens. So there is no lack of criticism from the electorate themselves about government policies. What is regrettable is that Bio’s desperate pursuit of power has turned him into an obsessive attention seeker, with an inability to observe any protocol. 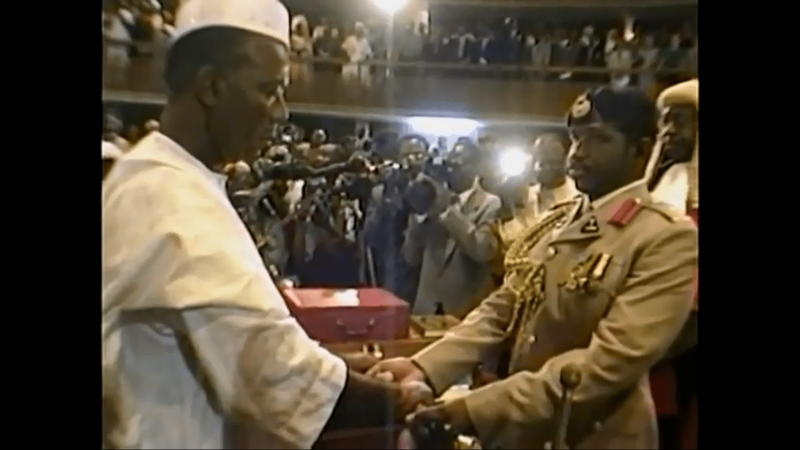 His two months as head of the NPRC military dictatorship, could not have gained him the prerequisite understanding and competencies to appreciate what it means to lead a civil democratic party like the SLPP, and work within the party structure as a team to build a cohesive force in pursuit of party objective, which is to win an election. 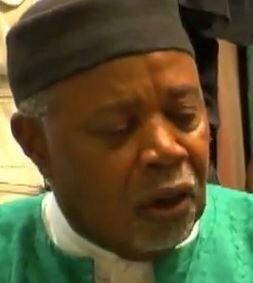 Correspondingly, it is not surprising that his factional support base has been cited by every report, including an open letter written to him by one of his supporters – Dr Sama Banya accusing his supporters of being responsible for violence in the SLPP. Bio is still running a parallel SLPP with his supporters. They are operating from outside of the centre. They undermined the last NEC, led by chairman John Benjamin (Photo: Right) and never allowed the NEC to function effectively. They are doing the same with the current NEC, led by Chief Somano Kapen who has been accused for not criticising the APC. Josephine Koroma’s article is a baseless attack on major players in the SLPP leadership, with deliberate falsehood aimed at discrediting better potential presidential candidates, whom the party can sell to the voters. 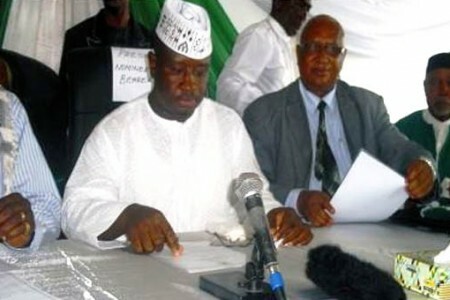 This attack on chief Kapen – the SLPP NEC chairman is particularly grotesque and has the capacity to undermine the chairman, and estrange him from the rest of the NEC members. It is an empty propaganda which serves to further ferment discord and conflict, at a time when the party is desperately hoping that peace may return. 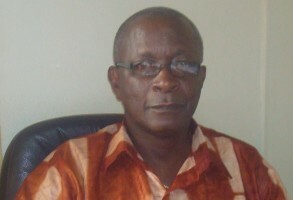 Andrew Keili (Photo) has been a source of inspiration to many Sierra Leoneans, including SLPP party members, through his weekly published “ponder my thoughts” articles, in which he analyses the ills of our country; criticise the shortcomings of the government and proffers solutions to them, based on his extensive knowledge of and experience in policy. I found Keili’s commentary and critique exceptionally brilliant, political and extremely educative. His forensic understanding of governance, gives him the ability to highlight problems and what can be done to address them. This is responsible criticism from a potential statesman who may well succeed president Koroma. 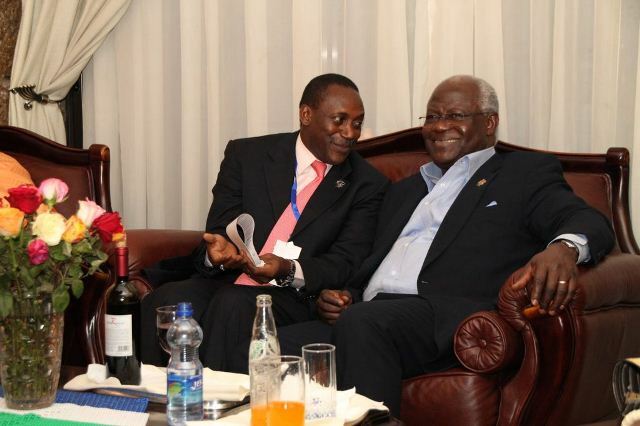 Kandeh Yumkella (Photo: kandeh left – Koroma right) is an international civil servant. He is currently leading a global project for the electrification of the world’s poorest nations – lacking in this fundamental engine of development. He is the special representative of the UN Secretary General. Without electricity supply, there would be no meaningful economic and industrial development, and the man steering this landmark project to make it possible is our own SLPP brother. His international duties do not sit comfortably with making controversial criticisms or specific criticism of any government, because his job is to work with governments to change the world for the better. Yet even with such diplomatic constraint, Kandeh does talk about poverty and politics in Sierra Leone. Like Andrew Keili, Kandeh Yumkella has also given credit to the government where it is due. They both talk of the SLPP achieving peace, creating stability through rehabilitation, and securing a sustainable transition from war to development. Both Kandeh and Keili are not seeking a populist sentiment, in order to exploit the pervasive poverty and hardship that the people of Sierra Leone are experiencing. The question now is: What moral compass has Julius Bio got to talk about corruption and the suffering of our people, when his actions as head of the NPRC military dictatorship contributed in no small way to the economic decomposition of the nation’s capacity to provide the basic essentials for citizens? He has been accused of siphoning funds from the state, meant for the development of the country, into his private overseas bank accounts. Or is he just exploiting the frustrations and hardships in our country in order to win power, only to do the same again? He has not demonstrated the ability to proffer solutions to the mirage of problems facing the unemployed youths and the economy in general, but is instead using his relatively younger age of 50, as a qualification for leadership, which to me is a concealment of his inadequacies and inexperience to lead. Bio is not known to be in gainful employment, and has never been, since he was forced to hold an election in 1996, to which he “reluctantly” complied. There is simply no record of him ever worked in Sierra Leone or elsewhere, which could explain his ownership of a house in America, building two houses in Sierra Leone and owning five jeeps. Julius Bio and his supporters should stop playing games with the future of SLPP. They should co-operate with the winning team to build a strong party that is cohesive and united around a presidential candidate who appeals to the wider national voters, as well as command the respect of the international community. It is time the SLPP stop defending the indefensible, and put the best option forward to an electorate, who deserve a credible alternative to a floundering and chaotic APC administration. Yankuba is from a family that has always been a problem for the SLPP. Why he and his likes will not leave the party alone, some of us cannot fathom. In 1967, a Kai-Samba who happens to be Yankuba’s father helped to destroy the SLPP through personal vendetta. In 2007, this same Yankuba Kai-Samba and many other misled ones abandoned the SLPP to join PMDC. He did not only do that, but he personally decided to use APC newspapers and blogs to write many unsubstantiated articles against the SLPP and its front runner Mr. Berewa. Together with others, their actions handed the 2007 elections outcome to the APC. Yankuba came back to the SLPP, because he was not given any position in the APC-PMDC coalition then. Since his return to a party which he has helped put into opposition, his lyrics has not been reconciliatory, but rather divisive. Why would anyone always want to be on the destructive end of things, instead of erring on the side of constructiveness? We are talking about bringing peace to the SLPP, and here is someone who is expected to behave like an elder – behold, is always writing diatribes against other SLPP members, who carry large following in the party. Let us assume that Bio is not elected as the next flag bearer, how would Mr. Yankuba and his ilk get Bio and his supporters to lend their support to Yankuba’s preferred candidate? This SLPP infighting has been going on for too long. We on the other side of the spectrum are expecting SLPP to mount a formidable opposition to the party of the day. But if SLPP cannot govern themselves, how could we trust them to govern the nation, if power is entrusted in them? If SLPP wins the election in 2018, they will be expected to form a government and follow the rule of law. Will they govern using the same negative tactics they have introduced into their party? 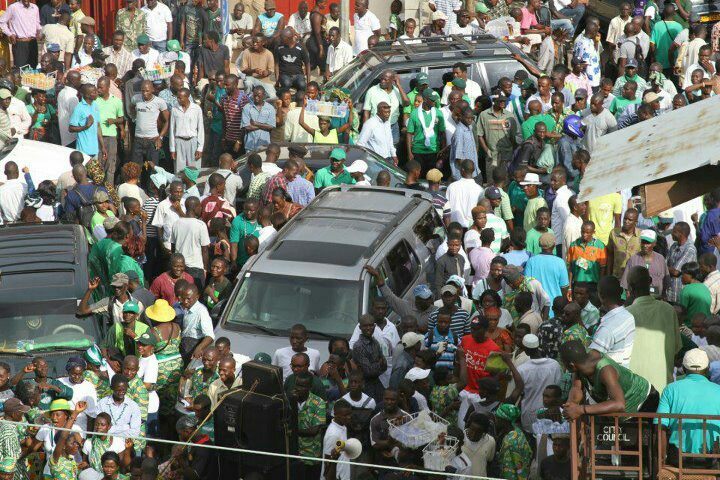 It is difficult for any true and understanding Sierra Leonean to vote for a party that is chaotic. The way I see it from the content of your article, is that the only obstacle to taking control of government is to EXPELL Bio from the Party. It is difficult to transform or change the mind-set of Bio’s supporters, and there are plenty of them who are willing to put their lives on the line for his leadership. Take it from me, we have no plan or chance of winning 2018 elections, should this ugly SLPP in-fighting continues.